Many jewelry artists and mixed media artists today are focused on recycling, reusing and up-cycling vintage and antique jewelry making components for their jewelry designs. While I think using new jewelry components are necessary and relevant in today's market place, I applaud the desire to reuse a beautiful brooch or beads that had their heyday once but now are sitting in old crusty boxes somewhere in a dark warehouse wrapped in faded tissue. Using vintage components in a jewelry design gives it that added special touch that many people fall in love with. I find it gratifying to use vintage components and beading supplies in my designs knowing that some pieces of the past have found a new home and are not discarded for waste. In the past several years it has become increasingly difficult to find quality vintage components. A few of my favorite items to use these days are vintage brass filigree stampings once used for the trade to make clip on earrings and brooches, these today can be transformed by adding patina, folding them over a center stone for a pendant or adding to a mixed media canvas for extra depth and dimension. Also worth noting are old chandelier parts. I love to put a photo or vintage picture glued behind a chandelier crystal and add some beaded chain for a one of a kind personalized necklace. Of course who can do without some fantastic vintage beads! There were so many great colors in the 40's and 50's, I love the banana yellows and the vibrant cherry reds. Giving your clients a piece of history in a handsomely crafted jewelry design is not only good for the environment but good for the soul. To find some of these fabulous vintage components, you can look for some interesting pieces at a local garage sales, your local bead store or in antique malls but by far the best place I think is the internet for those really unique pieces. I come across all sorts of great, hard to find supplies out there on the internet. Using a few good search terms and words can yield the unexpected find like 'vintage jewelry components' or more specific 'vintage brass stamping'. If you don't know what something is called, use a basic term like 'vintage chandelier parts', then look at a suggested site and gather more specific terms like 'vintage two hole faceted crystal' or 'vintage large teardrop crystal'. By adding different combinations using two to three words in a search term, you may stumble upon a great website that carries exactly what you are looking for. Happy hunting! Does some of your jewelry need a pick me up or makeover? You may find this service of interest! Adeline's Loft: Jewelry Service: "Do you own a jewelry from my past handmade collections? If you feel what you have is a little outdated in style or tarnished, I can provid..."
Sophisticated and elegant, our large white leather jewelry box will be a treat to use every day and also comes with three convenient take away travel cases. 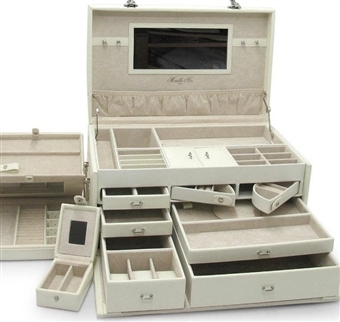 If you are looking for something classic and elegant, this white leather jewelry box is a beautiful solution. And, it's also available in black! Three takeaway travel cases. The first is a mini case, the second is a flat case with compartments for earrings, necklaces, rings and bracelets, the third is a lovely detachable jewelry roll. Mirror and useful storage pocket on inside lid. Length: 18" x Width: 8" x Height: 10"
Does your Mom have a collection of special rings? This jewelry box is beautifully with Bubinga wood. Bubinga wood is the wood used to make fine musical instruments and provides a lovely housing for fine jewelry. Designed specifically to hold rings securely between plush jewelry storage rolls, this ring jewelry box is a must have for a ring collector. It also comes with a lock and key for security. 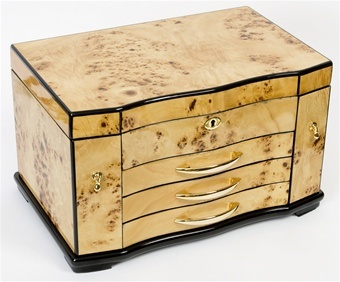 This jewelry box will take her breath away and features a unique design that enables this handcrafted jewelry chest to be fully locking. 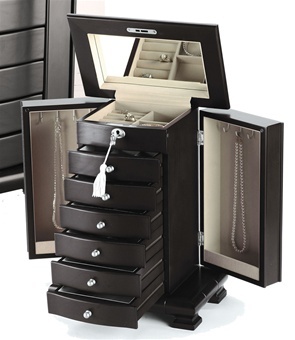 Storage features include divided compartments, ring rolls and necklace hooks to hold a wide range of jewelry pieces. This chest makes a wonderful gift for a mom that needs to organize jewelry collected over the years, or for a new mom looking to keep her jewelry organized as she adds to her collection over the years. 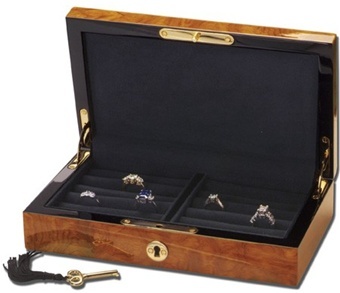 This jewelry chest ships with a complimentary jewelry pouch and brass plate for personalization. For moms that love jewelry, a dresser top jewelry box just doesn't hold enough. That's when a floor standing jewelry box is most appropriate and appreciated. 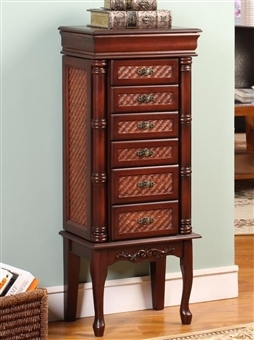 Our large cherry jewelry armoires features large gliding drawers to hold rings, earrings, bracelets, bangles, scarves and even lingerie. Long swing out necklace sides hold all lengths of beads and chains. Styled with rattan finishes, this jewelry amoire compliments tropical and classic decor. Consistently a customer favorite, this lovely dresser top jewelry box features armoire necklace sides, drawers for rings, earrings and bracelets and a locking top section to secure valuable jewelry pieces. Available in three colors, there's sure to be one that suits your mom. Choose from - Classic Cherry, Contemporary Espresso or Warm Walnut.